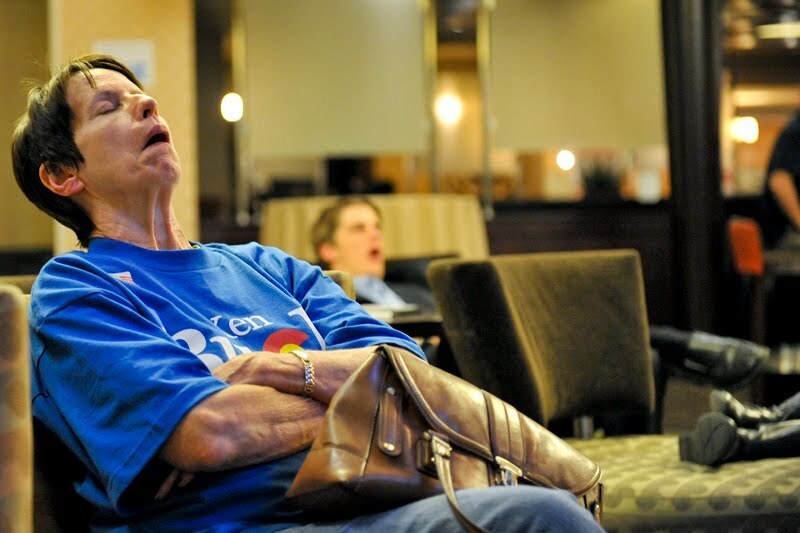 A Ken Buck supporter falls asleep waiting for results to come in for the Senate race between Ken Buck and Michael Bennett Tuesday night at The Double Tree in Greenwood Village. Bennett was declared the winner of the race Wednesday Morning. Prior to covering election results in Colorado I heard the the Michael Bennett Ken Buck race would be close so it was no surprise when 12:00 am rolled around and was it not only close only 60 percent of results had come in. With that and sheer bordom of standing around a stage I walked around the hotel the HQ was housed and found a Ken Buck supporter passed out infront of a TV.